Edging lines are used to condition the edges of material. 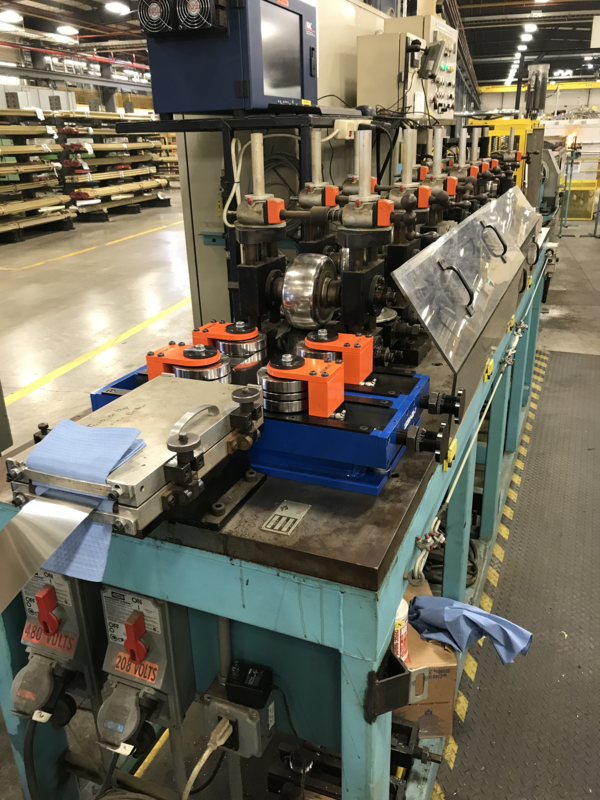 An edging line can range in design from a very simple set of hardened tool steel roller assemblies for de-burring, to a highly automated line capable of producing full round or shaped edges. This is accomplished by a set, or multiple sets, of opposing hardened rollers with a specific profiled shape. In the case of a full round edge, rather than a simple deburred edge, more than one roller set will be needed. In this case, each set of successive rollers will have a slightly different profiled pattern, so that each roller set does a small amount of work. The last roller set therefore imparts the finished desired shape. Many edging lines are incorporated into cut-to-length lines equipped with flying shears for continuous running to make burr-free specialty flat bars from coil. Single bar edging is used to condition the edges of individual parts and pieces. These machines may consist of multiple sets of profiled hardened alloy steel rollers that consequently induce a desired shape on the side of material. A continuous edging machine is used to condition the edge of material strip for downstream processing. These machines therefore consist of multiple sets of profiled hardened alloy steel rollers that induce a desired shape of the material.